Tomorrow we are leaving for a four day trip to Yosemite! Yay <3 Even I’m quite the girly girl, I do enjoy being outdoors and camping. We have some great hikes planned and it will be give me an opportunity to unplug from everything that has been going on as of late. It could not have come at a better time. Plus Fall in Yosemite is gorgeous! Read on to see how I style one of my favorite fall outfits! When I’m not subbing, you can usually find me wearing something much like this. 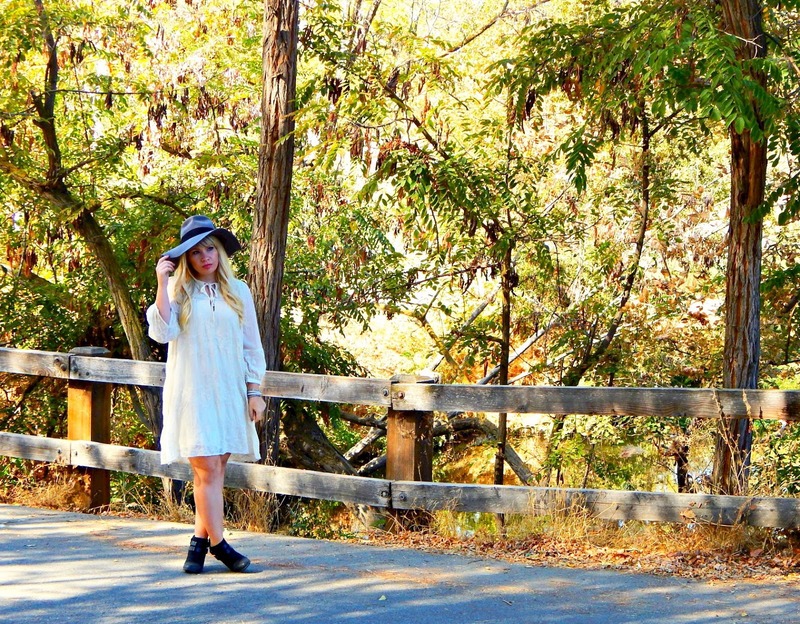 My “Fall uniform” usually includes a great hat, flowy dress, light jewelry and boots. These pieces are perfect for transitional weather and are super comfy! Although I love structured, feminine pieces, there’s just something about a flowy, romantic dress that makes my heart go pitter patter. 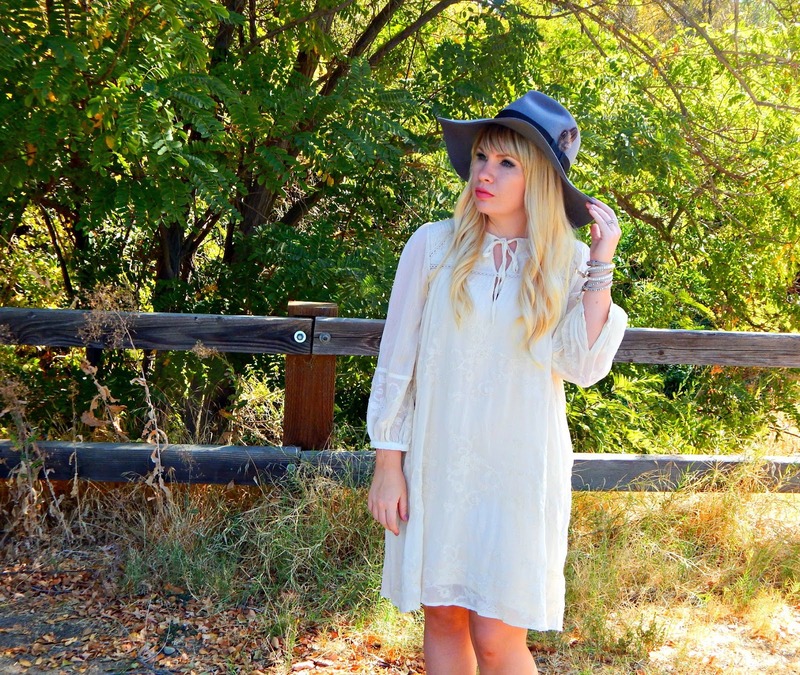 Whether it’s above the knee or a maxi, my love for sweet bohemian dresses is unsurpassed. I found this little beauty during my annual Anthro trip in Santa Monica for less than $30! And even though it’s reminiscent of a nightgown, I think it’s beautiful. I love dresses with a distinguished waist, but sometimes you gotta get out of the box a little bit :-). 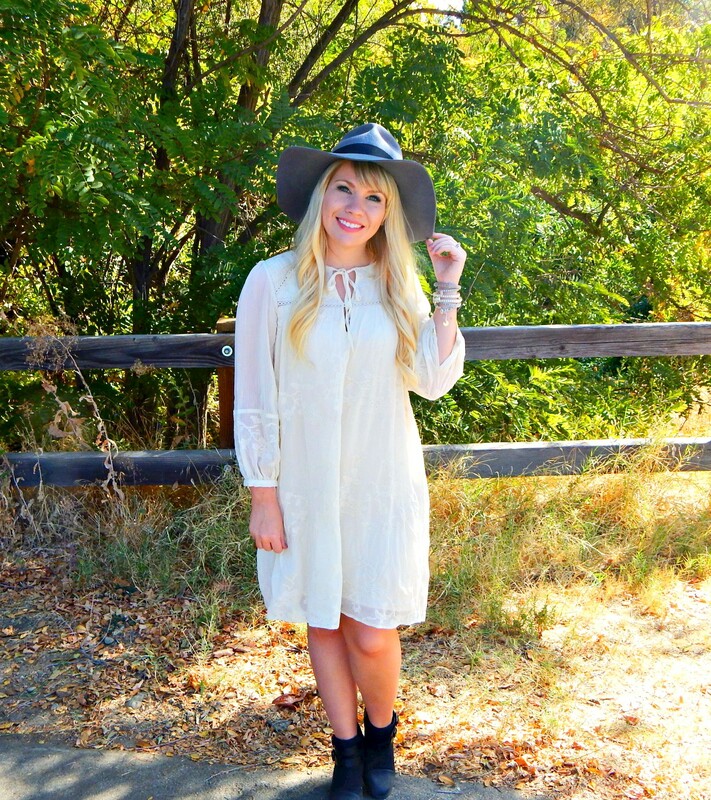 I paired this cream colored frock with an amazing grey hat, sparkly boho bracelets and black ankle boots. Then choose your boot: ankle (heeled or flat), riding, or over the knee. For a dress above the knee, any of these boot options will work. For a midi length, I think it looks best with an ankle boot. For maxi, I love both ankle and over the knee boots. Choose your headpiece (optional): floppy or rancher hat, headchain, headband, or flower crown. 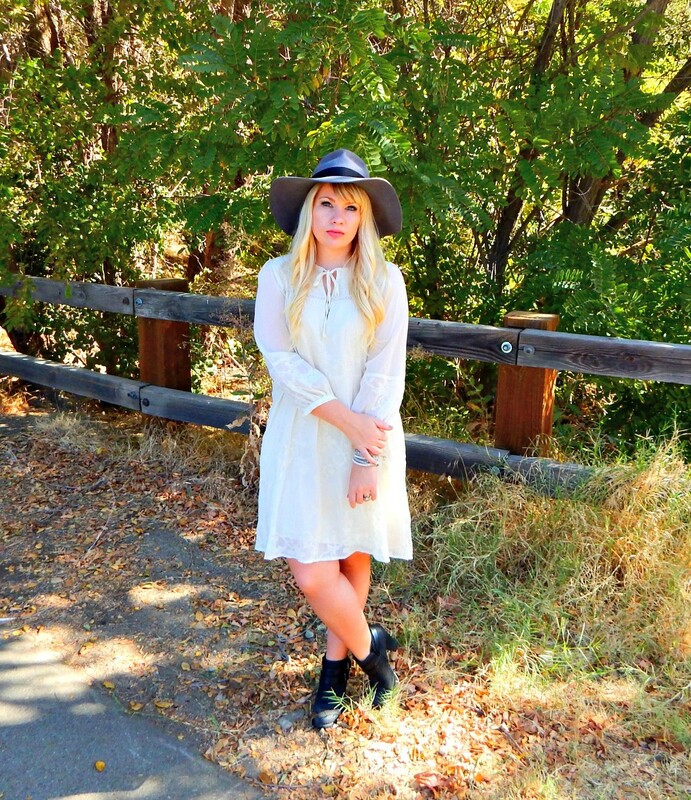 Personally, I love Fall hats so I style them a lot with this kind of outfit. If you’re looking for something a bit more delicate, headchains, headbands and small flower crowns work beautifully also. Even though I have a profound love for statement necklaces, they just don’t work with this kind of outfit. 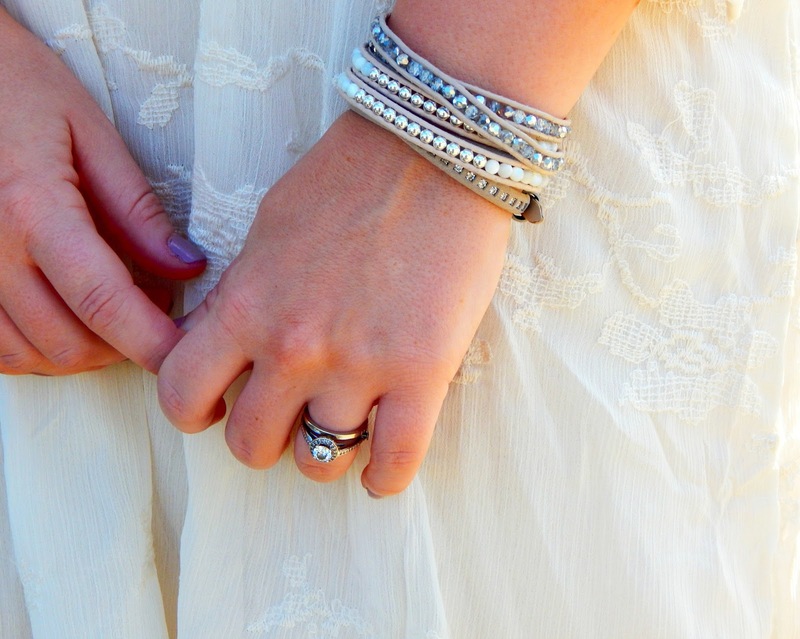 Instead opt for minimal, delicate jewelry. I have found that pendants and dainty necklaces/bracelets work great as well as bangles, wrap bracelets and delicate rings of all sizes.